If you're feeling overwhelmed by your collection of cardstock, patterned paper, and embellishments, you may find yourself in search of scrapbook furniture to help organize your supplies. What size of paper do you need to store? Are you an 8 ½ x 11 scrapper, a 12x12 scrapper, or someone who likes a mix of paper sizes? Do you prefer to have your supplies hidden when not in use or do you like to be able to see everything you have available with one quick glance? Do you need to keep certain items, such as paint or small metal embellishments, away from your children? How often do you buy new scrapbook supplies? Does the size of your supply stash remain constant or does it seem to be continually expanding? If you don't have a dedicated scrapbook room, what other activities need to be taking place in this area? For example, do you need space for paying bills or helping your kids with their homework? Taking measurements of your craft area is also a smart move. Falling in love with a particular piece of scrapbooking furniture only to discover it won't fit in your home can be a very frustrating experience! Generally, furniture for scrapbookers can be grouped into two categories: standard and customizable. Each has its own unique advantages and disadvantages. Standard furniture for scrapbookers is available in just one configuration, similar to what you'd expect to find when shopping for a desk for your home office. It's simple to put together and relatively inexpensive. However, you may find it difficult to stay organized if you're continually adding new items to your collection of scrapbooking supplies and unable to change the design of your furniture to accommodate these extra products. Customizable scrapbook furniture usually comes in the form of cubes that can be stacked to create storage chests, desks, shelves, or other items for your craft room. The cubes can be made of wire, wood, or plastic. Customizable storage is a good choice for the scrapbooker who is constantly adding to her collection or those who move often and need a system that can easily be rearranged to fit a different space when needed. Organize It, a store dedicated to helping you organize every room in your home, has a section of its Web site devoted to scrapbook furniture. Products available include craft workstations as well as customizable cube storage options. 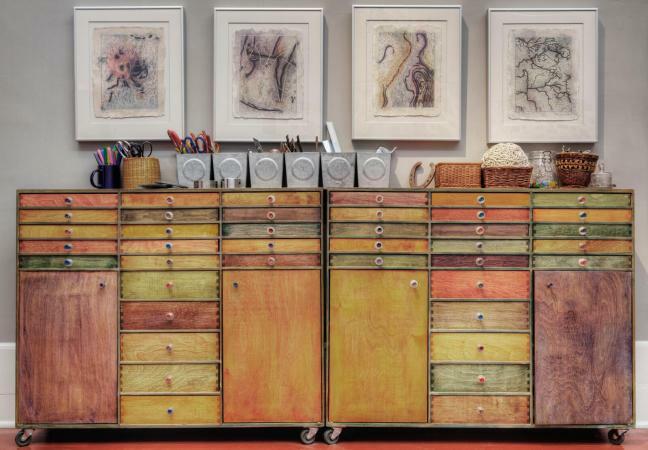 The Container Store has a section of its Web site devoted to creative Spaces which contains many useful ideas for organizing your scrapbooking supplies. The company's component desks also offer a number features that make them a great choice for scrapbookers. Walmart offers the South Shore Crea Craft Table with plenty of shelves and drawers to hold all your scrapbook supplies. Store everything neatly and work on the roomy table top. You'll also find other options. As you're shopping for furniture for your scrapbook room, remember to factor shipping and handling costs into your purchasing decision. Since furniture for scrapbookers is often bulky and heavy, the cost for shipping can add a substantial amount to your purchase price. If possible, try to buy the items you need when there is a coupon or special "free shipping" promotion available.